Our team of professional waterproofers is standing by to provide you with a customized, warrantied solution. To schedule a free, no-obligation basement waterproofing quote with one of our specialists, contact us by phone or e-mail today! 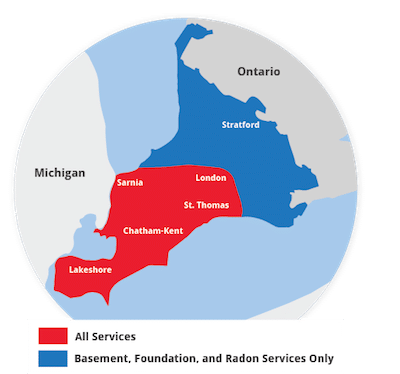 Our Ontario service area includes Sarnia, London, Windsor, Chatham and many surrounding areas nearby. At Advanced Basement Systems, we specialize in the unique problems that below-grade spaces present. Our installations include a written, transferable warranty that will provide you with long-lasting peace of mind.